Hédène, is the willingness to restore French honey’s nobility through a wide range of monofloral regional honeys with uncommon tastes, colors and textures. Noble and natural, Hédène French honeys bring to light the wonderfully rich floral heritage of France through a unique traditional know-how. 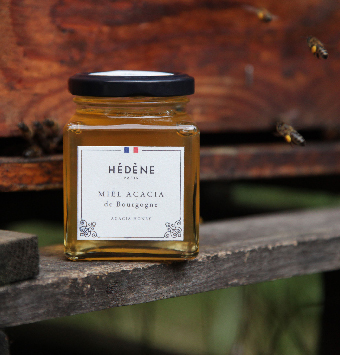 Hédène offers exceptional French honeys with an incomparable refinement as apiaries are established in the most beautiful wildflowers parcels of France and honeys are cold extracted. Whether you enjoy them raw with a spoon or in a recipe, Hédène honeys will take your senses to an unforgettable journey. Thanks to its traceability and high quality process, the brand is appreciated by the greatest starred chefs and distributed in the most prestigious gourmet places in France and internationally. 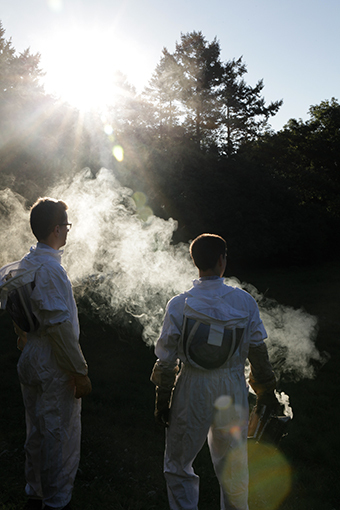 In the beginning, there are two beekeepers in love with French honey: Cyril Marx and Alexis Ratouis. Both born in a family of beekeepers, they connect through a passion for this noble and natural product, with multiple flavors and source of intense pleasure. Both graduated from “Rucher-École du Jardin du Luxembourg” in Paris, they realized they both wanted to innovate in the honey sector. Hence they decided to create together Hédène, defined by a 100% French luxury positioning and core values such as traceability, refinement and deliciousness. Today, Hédène is a renowned brand for its know-how, specialized in French honey and appreciated by top starred chefs for its exceptional refinement. Thanks to a wide range of 100% French honeys, Hédène highlights the wonderfully rich floral heritage of France and offers a journey through senses and regions. 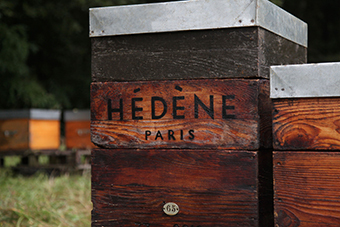 Every Hédène French honey comes from a French soil’s emblematic flower and distinguishes itself with a unique aroma. The traditional beekeeping know-how specific to Hédène imparts to every honey a higher quality as apiaries are established in the most beautiful wildflowers parcels of France, honeys are cold extracted and every designation is authenticated. As a pioneer in 100% French gourmet honey, Hédène’s desire is to show the diversity of honey flavors through a wide range of rare honeys. Through their unique flavors, colors and textures, Hédène French honeys provide an extraordinary taste experience. Sweet or intense, crystal-clear or copper-dark, liquid or creamy, these honeys will light up your day at any time: for breakfast, tea-time, with a yogurt or with cheese, to brighten up a recipe or even raw, eaten with a spoon. Beyond a journey through the senses, Hédène honeys are also a journey into French regions. From Tarn to Burgundy or Jura, Hédène honeys promote French floral heritage to the delight of epicures… everyone will be pleased! The name Hédène is a reference to Eden garden in the Genesis and the crucial role of the pollinator bee. In addition to this, the H, is an allusion to hedonism, hence honey, with its range of flavors, colors and textures, offers various pleasures at any time of the day. Regarding the E, it refers to the sweetness of honey, a raw and natural product. Finally, the accents illustrate the 100% French origin and French-style refinement. The word Hédène is as unique as the brand’s image and its range of honeys. With its multiple partnerships in the world of gastronomy, Hédène has an innovative process and shows honey is a proper ingredient. Just like spices or olive oil, it might brighten up your favorite dish. 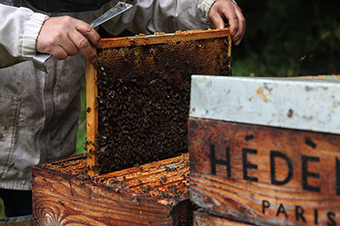 Symbol of French excellence, the aromatic finesse of every Hédène honey is suitable with any recipe. Serge Vieira, an emblematic figure in the world of gastronomy, 2 Michelin-stars and Bocuse d’Or, is a perfect example as he is Hédène’s godfather. Chef Vieira was appealed to the unique flavors of Hédène honeys and the development of French soils. 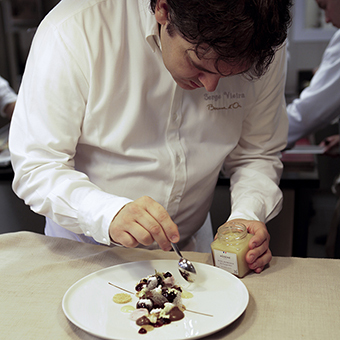 He cooks with Hédène honeys to brighten up the menu of his gourmet restaurant, located in Chaudes-Aigues in Cantal. Some one-of-a-kind recipes have been created with him, to the delight of finest epicures. Hédène is also distributed by the best master cheese makers, who are all about traceability, soils and flavors. Many Best French Cheese makers, including Michel Fouchereau, Marie Quatrehomme, Pierre Gay or Ludovic Bisot, are part of Hédène’s prestigious ambassadors. 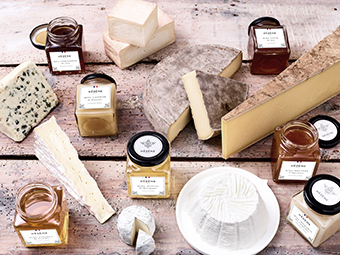 This process with cheese shops, supported by the Federation of French Cheese Makers and French Dairy Interbranch Organization, gave birth to the greatest associations of cheese and Hédène honeys. It renewed the art of tasting those noble products with various commonalities.